Each time an opponent's monster activates its effect, place 1 Spell Counter on this card when that effect resolves. You can send this card with 6 or more Spell Counters to the GY; add 1 Spell from your Deck to your hand. You can only use this effect of "Mythical Bestiamorph" once per turn. 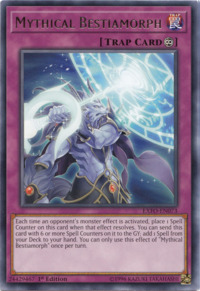 Mythical Beast Master Cerberus appears in this card's artwork.